Michelle Fields is a journalist who worked for Breitbart, which may be the single most pro-Trump publication on the Right. She was attempting to ask Donald Trump a question when his campaign manager Corey Lewandowski jerked her away from Trump. The Secret Service agents handle Trump’s security and you can be sure that they don’t want or need Corey Lewandowski’s help to do their jobs properly. Although many people have claimed that Michelle Fields couldn’t have been hurt because she didn’t scream in pain or crumple up in a ball, she IMMEDIATELY talked to another reporter about how it hurt and she had bruises. So, whatever you think about the video, Lewandowski did do some damage. If they were competent, that’s what they would have done. If they were smart, that’s what they would have done. Perhaps most importantly, if they were honest, they would have NEVER chosen to lie about it publicly. Worse yet, Donald Trump also lied. Maybe that was because being Donald Trump and apparently even a Trump staffer means you don’t ever have to say “sorry,” even when you’re wrong. Maybe it was just because they thought there was no video at the time conclusively proving they were lying and that made them think they could get away with it. Either way, it was so staggeringly dishonest, stupid and incompetent that it set a chain of events in motion. First off, the management at Breitbart made the world’s limpest request for an apology while it actually published some articles undercutting its own employee’s story. It was the most craven response I’ve ever seen from a conservative news outlet and I can only assume it went that way because Breitbart didn’t want to risk its cozy relationship with Trump. By the time it was over, six of its employees, including Michelle Fields, left because they found the behavior of Breitbart’s management to be disgraceful. There are still some great people working at Breitbart, but there are less of them now because of Trump and the whole organization received a black eye because of him. Michelle Fields was also put in a terrible position because of the dishonesty, stupidity and incompetence of the Trump team. She left her job. She suffered abuse from Trump fans online who falsely assumed she lied because Trump said she did. She was also being publicly smeared and written off as a liar by the Republican front runner. People were even encouraging Michelle Fields to go to the police if she wasn’t lying, “Why doesn’t she do that? Obviously because she’s a huge liar! ” So, after Fields was backed into a corner by the Trump campaign and left with the option of being forever branded a delusional liar who “made it all up,” she filed a complaint with the police. Then the response to this was something akin to, “How dare she file charges!” Of course, the police didn’t have that reaction. They looked at the video, saw Corey Lewandowski jerk Michelle Fields backwards and filed simple battery charges. Incidentally, simple battery is not a high bar to get over in Florida law. It’s “Any actual and intentional touching or striking of another person against that person’s will (non-consensual), or the intentional causing of bodily harm to another person.” Does that description fit what Lewandowski did? Yes, it does. 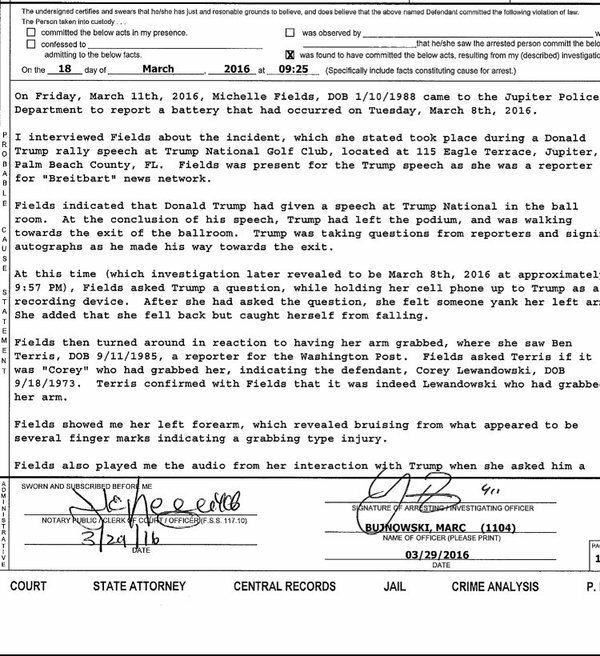 It’s also worth noting that injury IS NOT required for a conviction which seems very relevant since Lewandowski grabbed Michelle Fields hard enough to bruise her. So now Trump, who initially said the incident never happened in the first place, is now claiming that Michelle Fields was touching him and that he was in danger because she was carrying a “pen.” Moreover, just because Trump keeps claiming Fields has changed her story doesn’t mean it’s so. As far as I can tell, her position is exactly the same as it was in the beginning. I could go deeper into the lies, misrepresentations and attacks on Fields that Trump is making, but why should anyone take what Trump is saying now seriously after he’s already lied once about the case? Setting that aside, think about the politics of this. After bashing Ted Cruz’s wife and being blamed for a National Enquirer story that smeared more conservative women, Trump now has to deal with his campaign manager being charged with battering a woman while Trump supports him to the hilt. It looks awful because it is awful. It also deepens the loathing of Trump in many corners of the conservative press, among chivalrous men and among women who’re horrified by the way Fields was treated. Of course, the real truth is that Trump almost has to stick with Corey Lewandowski because it’s impossible to replace him. At least for the moment, very few quality people will work for Trump at any price because the hatred of him is so deep that working for him means you may not get another job in DC Republican circles if he loses. So although Trump has a few quality staffers, he has a third rate organization overall and it makes Corey Lewandowski almost impossible for him to replace unless he gets the nomination. Because of the highly suspect new allegations Trump is making against Fields (Is that competent? Is that smart? Is it honest?) and the fact that Lewandowski looks like he’ll have to go to trial, this issue is likely to hang around for awhile. Also, even though it’s impossible to know what will happen at a trial, it’s entirely possible Lewandowski will be convicted. What happens then? Whatever it is, the Trump campaign people will deserve it ten times over because they could have prevented all this by doing the right thing and apologizing right off the bat. Now they have to reap the consequences of their dishonesty, stupidity and incompetence.